Apples are the lynchpin of the fall harvest season. Some may think pumpkins wear the crown but I firmly believe the apple is king of autumn in America. Crisp, sweet, flavorful and so good for you. That old adage of an apple a day has some basis in fact. When you get tired of apples in the raw; try an apple crisp. It is very simple because there is no crust to roll out or position over the apples. Dump, sprinkle and bake: a 7 year old can make this if you cut up the apples for them. If you can, get the organic ones as the sprays they use on growing apples are not at all good for you. I made this today with some Jonagold apples from a farm stand and it was very tasty indeed. I especially suggest you get your apples at an actual apple orchard if you want the most appley taste. South of Hellertown is Bechdolt’s Orchard which grows many apple varieties. Go there if you want the freshest tastiest apples in this geographic area. Apples grow all over the globe so you shouldn’t have problems getting them just picked! The variety is up to you but I would not suggest any that are not meant for baking; don’t use red delicious as they are for eating only, same for honey crisp apples. This recipe is out of Gluten-Free Baking Classics Cookbook by Annalise G. Roberts with a few minor changes. I am betting you can use any GF flour mix in this recipe, crisp is not like a cake or other baked goods that have very specific flour requirements. I have made the topping several ways. 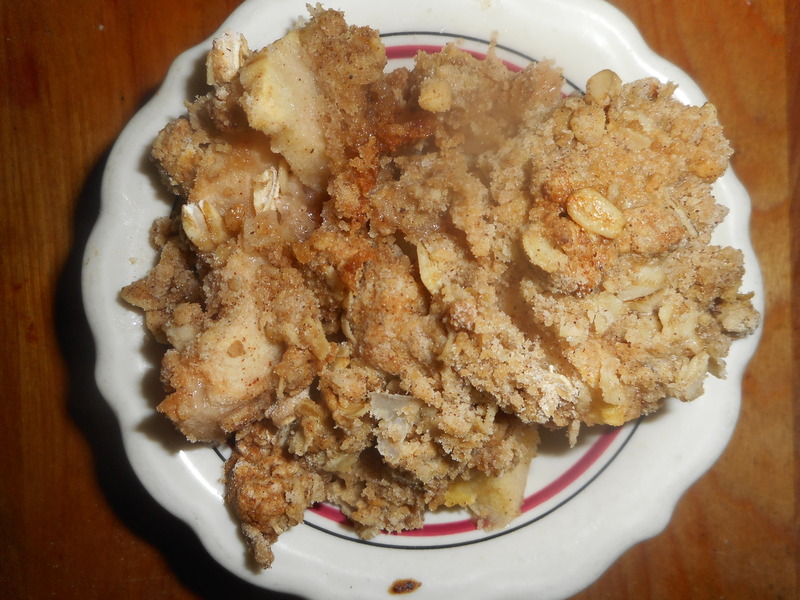 You can cut un-melted butter into the dry ingredients; it makes for a firmer crumb than the melted version below. I have made it egg free but it really somehow needs that egg to pull it together to mimic a wheat flour based crisp. The oats can be left out if you don’t like them or can’t eat them. I personally love oats in my crisp. A quarter cup of chopped nuts can be added to the topping; really a nice touch too. I don’t like it too sweet so I use the lesser amount of sugar. This is entirely a personal choice. You can up the nutritional value by adding flaxmeal to the dry mix; 2-3 tbsp. For those who love ice cream, this recipe is absolutely perfect with a big scoop of vanilla ice cream next to it. I like it warm from the oven but it also is tasty cold the next day, if you have any left over that is! Directions: Heat oven to 350 degrees. If your oven seems slow make it 375 degrees. Put a rack in the center level of oven. Lightly butter a 9 inch square pan or spray with cooking spray. Combine all the dry ingredients. Add egg and stir to mix well. 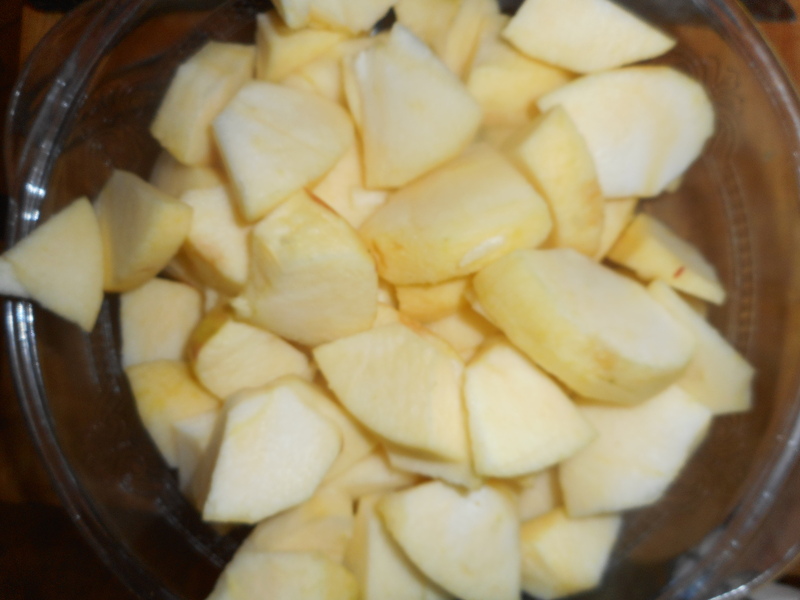 Place apples in the baking pan, top with the dry mix and sprinkle with the melted butter. Bake 40-50 minutes until bubbly and the topping is lightly browned. Let cool at least 10 minutes before dishing out. Six servings.